Remarks After the Hanging of John Brown was a speech given by Henry David Thoreau on December 2, 1859, at the time of John Brown's execution. 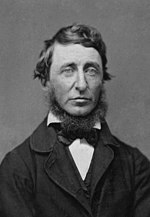 Thoreau gave a few brief remarks of his own, read poetry by Sir Walter Raleigh ("The Soul's Errand"), William Collins ("How Sleep the Brave"), Friedrich Schiller (excerpts from Samuel Taylor Coleridge's translation of "The Death of Wallenstein"), William Wordsworth (excerpts from "Alas! What boots the long laborious quest"), Alfred Tennyson (excerpts from "Maud"), George Chapman (excerpts from "Conspirary of Charles, Duke of Byron"), and Henry Wotton ("The Character of a Happy Life"), and then quoted from his own translation of Tacitus. ^ Gross, David M. "H.D. Thoreau on John Brown • TPL". The Picket Line. Retrieved 2018-03-04. Remarks After the Hanging of John Brown at The Picket Line.